As a vicious dragon stalks the Southlands, Crown Prince Gareth ventures to the forbidding North in search of the only man who can kill it. He is Lord Aversin, the Dragonsbane, whose dragon-slaying days have won him renown across the land. 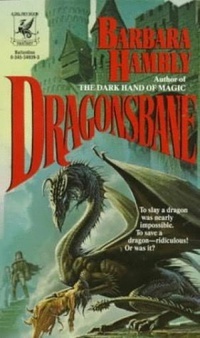 But when Gareth finds Lord Aversin, he discovers the mighty hero is squat and bespectacled, the ruler of a mud-village who admits that he killed the dragon not with a lance, but with ignoble poison. Still, he’ll have to do. Gareth and Aversin set off in company with Jenny Waynest, a witch with great ambitions but disappointingly puny powers—a ragtag crew destined to become legendary, or die in the attempt.